My sister in law gave me a handful of their Luyang Dilaw (turmeric ginger) harvest last year. I thought of using it to cook my family’s favorite Tinolang Manok. Verdict? This is tastier and smells good than the ones cooked with ordinary ginger. 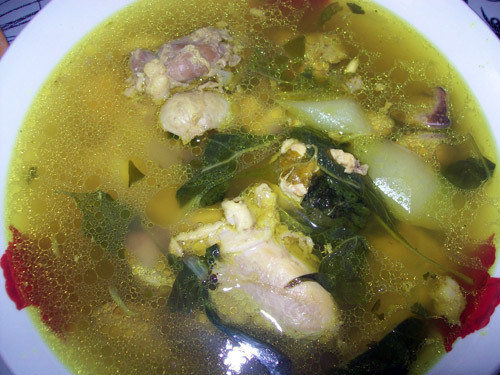 Luyang Dilaw eliminates the lansa taste or aftertaste of the chicken. Saute garlic, onion, turmeric in a small amount of vegetable oil. Add chicken, gizzard and liver, papaya. Drop some salt or a teaspoonful of fish sauce (patis). Add water to boil. Add salt or fish sauce to taste. Add chili leaves in the latter part of cooking. Best served when hot. This entry was posted in All Year Round Food, Comfort Food and tagged Tinolang Manok, Tinolang Manok sa Luyang Dilaw on January 7, 2011 by Yami. wahhh, this is making me drool; sarap naman a ang daming sabaw…sabaw pa lang ulam na :-). Yummy! parang ang sarap naman nito kahit sabaw na lang. I love Tinola!!!! sarap naman nyan sis! I miss my mother’s version..